Cover – wraparound – by Nik Morton to illustrate the story by P Andrew Miller. 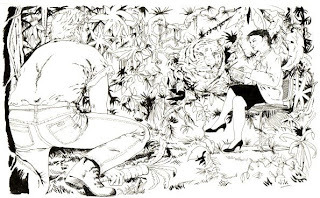 Interior illustrations by Philip Rowlands, Sydney Jordan, Paul Cockburn, Kerry Earl, Nik Morton, Russell Morgan, Debs Dumbrell, Dallas Goffin and Marge Simon. Crikey – typed on Amstrad PC386SX using Locoscript PC CG Times font 12pt 50% reduced! Printed by Gosport printer but some line artwork didn’t come out too well!